Posted by Andy Powell on Feb 22, 2019 in Events, Latest Events (please also check facebook link) | Comments Off on Plaza Time Again! 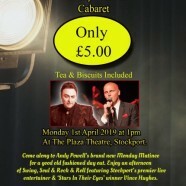 Andy returns to Stockport Plaza for a new afternoon cabaret show on Monday 1st April with special guest Vince Hughes. Tickets only £5.00. Contact the Plaza on 0161 477 779. 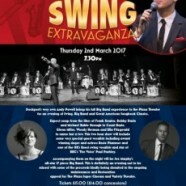 Big Band Swing Extravaganza – March 1st 2018. 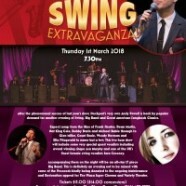 Posted by Andy Powell on Jan 20, 2018 in Events, Latest Events (please also check facebook link) | Comments Off on Big Band Swing Extravaganza – March 1st 2018. After the unbelievable success of last years show Andy returns to The Plaza Theatre for another evening of big band and swing classics. Accompanied by Paul Rigby’s Northern Jazz Orchestra and special guests Sara Creeney and Asa Murphy, this promises to be an evening not to be missed. Posted by Andy Powell on Apr 19, 2017 in Latest Events (please also check facebook link) | Comments Off on Big Band Success! A sellout audience witnessed The Andy Powell Big Band Experience at the beautiful Plaza Theatre in Stockport to help raise funds for kinder Mountain Rescue and the theatre itself. Special guests Paul Pashley, Rosie Plummer and Tom & Josh Phillips all added to the amazing sounds of the Jez Murphy Big Band making it a night to remember for everyone present. Posted by Andy Powell on Feb 3, 2017 in Latest Events (please also check facebook link) | Comments Off on Back to Cottons 2017! Andy will be returning to The Cottons Hotel & Spa throughout December 2017 as the resident singer/host on all The White Christmas evenings. 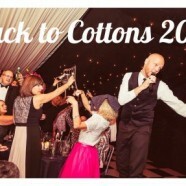 Book early to avoid disappointment as Andy returns after a 4 year absence to one of Cheshire’s finest hotels. Posted by Andy Powell on Feb 3, 2017 in Latest Events (please also check facebook link) | Comments Off on Live From The Plaza! On Thursday 2nd March 2017 Andy will be bringing his Big Band Extravaganza show to The Plaza Theatre. 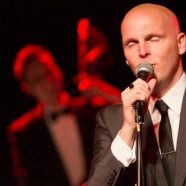 Join Andy and special guests performing some of the finest songs of the Swing era and the Great American Songbook. 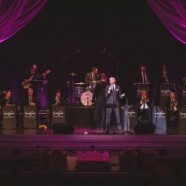 Accompanied by Jez Murphy’s all-star 17 piece swing band this promises to be a night not to be missed. Tickets available from the plaza Theatre on: 0161 477 7779.